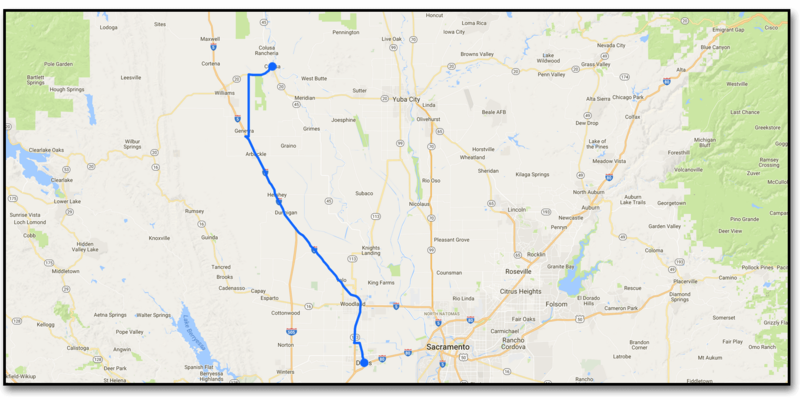 Day Twenty Nine, Colusa-Sacramento River State Recreation Area to Davis to Solano River, California. Got up early and drove into Davis and parked the car and decided to start riding immediately to Solano River Conservation area. The temperatures were in the high 30’s by 11:00 and we thought we could chance the heat and we didn’t want to wait around Davis for the day so we said screw it, let’s go! The ride started out OK, but after a couple of hours the temperature soared into the mid 40’s and we were getting anxious about our chances of making it to the campsite alive! We barely coasted in at about 15:30 and the park ranger rushed out to bring us into the air conditioning where we could cool down as we both were showing symptoms of heat stroke! The Solano River Campsite is OK, but they kind of give short shrift to hiker/bikers as our site was extremely run down and messy. Tomorrow we will try to get to Napa and all future maps will be on Strava. Here is the Strava map of our trip to Solano from Davis. Getting ready to start from Davis. Holy cow it’s hot! Look – cactus!. Stopped in Williams for a beer. Well at least they have Peacocks. And the Solano River is pretty nice. Hike and bike sites – not so much. Need to charge your phone?